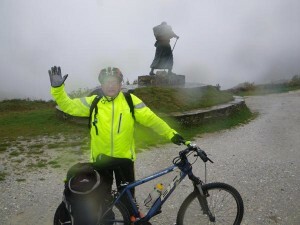 Listen to Timmy Mallet’s audio commentary recounting his recent cycling pilgrim on Camino de Santiago! Portraying his experience and encounters along the way. If you are considering going on the Camino either walking or cycling this is well worth a listen. 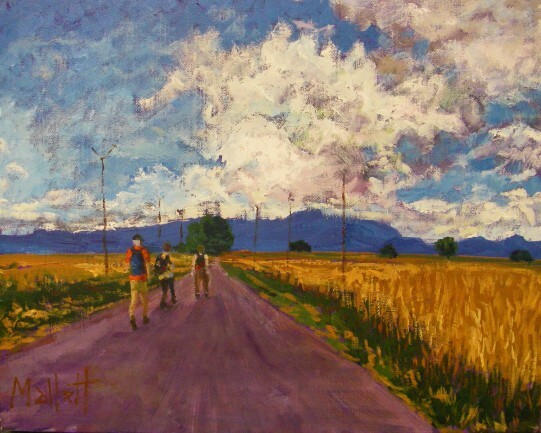 A painting by Timmy Mallet of pilgrims on the Camino de Santiago. I love the starkly bright colours of the Camino de Santiago – The Way of St James. Here the never ending wheatfields disappear into the mountains of Leon and the 3 peregrinos (pilgrims) make their way towards their distant destination, several weeks away. I love the big skies of Northern Spain. I can imagine St Francis of Asissi plodding this route 800 years ago….